Can't speak for the manual as I don't know which of the versions you are referring to (and have nothing to do with it), but the wiring at the motor connectors is correct on the image so far as I am aware. The reason for the blank spots on the motor connector is because this same connector is also used for six wire unipolar motors. I have no idea why the manufacturers of the motors (not FT's fault) chose to transpose the middle two connections, but they did. Anyway, if you trace out the green/yellow/gray/red sequence on the board end to the motor end you will find that it correctly transposes to the necessary green/gray/yellow/red sequence there. If you do not transpose the yellow and gray wires the motor either won't run, or could damage the step stick because you would be cross-connecting the two phases which might defeat the current control logic. So basically- It depends upon which end of the cable you are looking at. The manual should perhaps have explained this a bit better. What the manual SHOULD do is to provide concise instructions on assembly without having us risk damage to the board which would undoubtedly be blamed on the user. However, with what I've experienced so far, that would be too much to hope for. I had been using the R2 manual I printed in the ancient days of two weeks ago when I got the kit. Fortunately, the WIP manual has come along. It seems the default is for green and gray to transpose. Because I had to remove the pins from the molex connectors to fit the wires through the braids, my pins are straight through, they don't cross over. So I guess I'll have to re-do that. I take it, then, that the WIP manual of 12/4/17 is the way to go? @Hammerhead- It seems the default is for green and gray to transpose. No. Actually, the yellow and gray wires are the ones to be transposed between the board and motor. 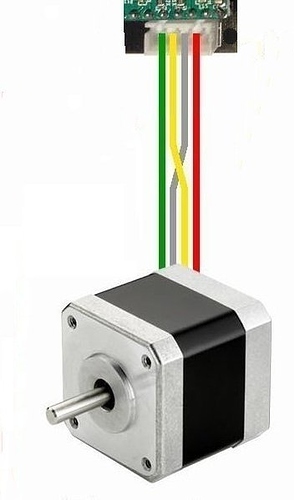 The green and red should always be to the outside ends of the connectors on both the motor and board ends of the cables for normal direction travel. If you want to reverse the direction of the motor electrically (such as for one of the two Y motors), you simply swap the order of the wires left for right. If you want to do it in firmware, there are options for that too, but they don't help with paralleled motors such as on the Y axis. 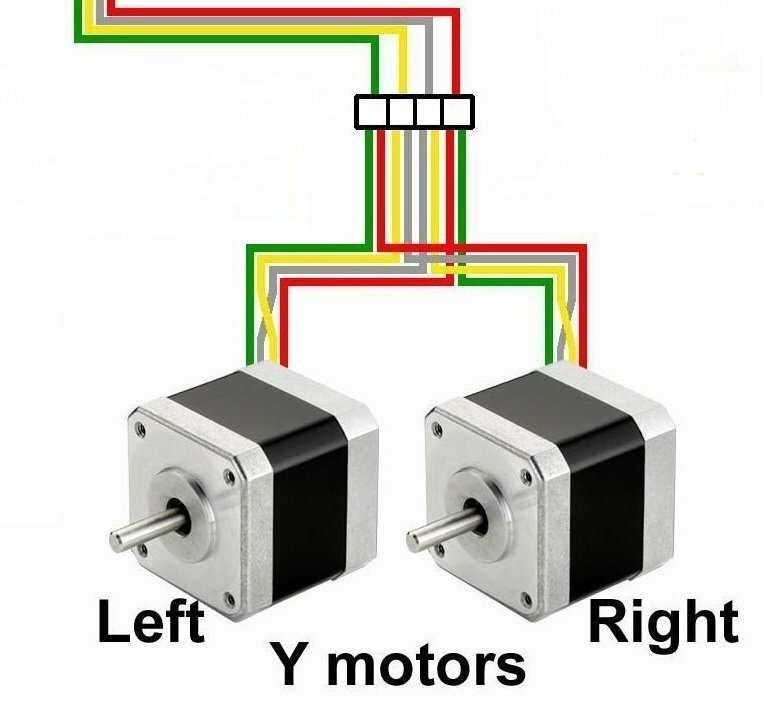 You must reverse the connections on one of the two Y motors, and that is shown in the drawing. But either way the sequence of wires at either end of the cable should be the same as shown above. 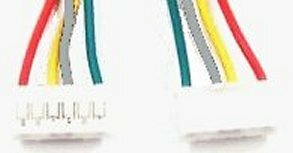 Either green-yellow-gray-red or red-gray-yellow-green at the PC board connector. 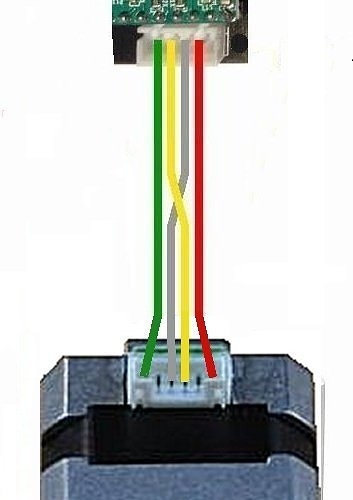 Green-space-gray-yellow-space-red or red-space-yellow-gray-space-green at the motor connector. I haven't looked at the WIP R2 manual (I have an R1 printer so it doesn't apply to mine). There aren't any crystal clear schematics (traditional style, not pictorial) in the manuals, or on their website. To be fair however, what percentage of users can read traditional schematics? So pictorials with adequate explanation texts should be present instead. Roger that. Sorry, I mis-spoke. That's what I meant to say. So, then the guide from the WIP manual can be relied upon? IOW, presuming we cut the molex connectors off both ends at the board side, and wire precisely as described on page 68 of the WIP manual, we should be OK, yes? One for the limit switch wiring, one for the heater wiring and another for the thermistor wiring could be good too. As for the WIP manual, I have no idea. I'll try to obtain a copy and look through it tonight though. I looked at the versions of the WIP manuals on the link at the top of this page, the only ones I could find. Perhaps I am missing something but I didn't find any wiring information in them at all. Where did you get the 12/4 version you referred to? The link in your last post doesn't work for me if that's where it is (will not load). As for the manual itself though, so far it is fantastic when compared to the manual I used (sort of) to build mine a year ago. I sure wish I had had this new one at that time. Kudos to @csorrows for all the fine work and effort that have obviously been put into it. And, please consider measuring from the bottom plate to the middle rails rather than from the top rail down. It is both more accurate and more relevant to the assembly. A simple spacer for the purpose to gauge the height would work wonders. Or I'll bet that one of the 8mm corner rods could be used with a little imagination. Bad URL paste. Corrected above. It's the 12/4 WIP manual, page 68. Yes the guidance on page 68 looks correct to me. However let me add my take to it. If you have a soldering iron and some 1/8" heat shrink, solder and cover the connections rather than using the screw terminal blocks. That is a much more secure and longer term method. Plus you will not have the bulky connector hanging around. Also, if you measure the motor ends (from motor to splice) to the middle of the back rail you can tuck the wires neatly up into a slot on the back center rail. Maybe leave 2"-3" of extra wire as slack and measure them to the middle of the rail. Finally, don't tuck the wires up or tape them until you confirm the correct direction of rotation for both. If they are backwards, just swap the wires to the motors. I used some Kapton tape to secure mine and later printed clips to finish the job. I don't like seeing open wires, but that's just me. Heads up, then... the Folger manual shows different wiring schema on different pages. With the WIP manual being far more correct and complete, I don't know why they don't pull the original down. It'll only create confusion and possibly lead to damaged electronic components if the wiring convention isn't observed. You are preaching to the choir as the saying goes. That was only one of a number of discrepancies and shortcomings in the original manuals. I wasn't kidding when I said I "sort of" used the manual a year ago. This was all before ever turning the power for the very first time and all of that is different than the build manual of that time. Ron, I think something is not right. If you check your wiring diagram, you have the Y axis leads transposing. That's consistent with what's presented later in the manual where the green block is shown on page 56. What's odd is that the old manual still shows a dual-z setup, and the combination of wires are straight, color to color, pins to pin. Since both motor sets are mounted from the bottom, one would expect that clockwise and counterclockwise would be consistent. So, in short, I'm stuck. My Y axis motors are just not moving. What am I doing wrong? Keep in mind that I removed the molex connectors are one point, and replaced them in a straight line (no transposing of gray/yellow) so would that explain why jogging in a positive Z causes the table to go down, and jogging +X causes the print head to go left? Yes, they are correct as shown both on my diagram and on the original one presented earlier in this thread. What has been done for the new single Z motor version (R2) and manual though I have nothing to do with. But I see nothing wrong with what is on page 68 of the new manual. It is consistent with the diagram earlier in the manual and the ones on this thread as well. The Z motors (R1, dual motor setup) do not transpose because they run in the same direction as one another, so their colors are carried through to the motors. However if you look carefully at the Y motors, the left-to-right wire order of one of the Y motors is intentionally opposite to the order of the other, but that this transition is performed at the splice, not at the motor connectors. Perhaps they need to make it more explicit that the transposed wires are for the Y motors only, but with a single Z motor there is no splice in the wires to it. This makes the two motors turn in the opposite directions, which is what they must do mechanically. But, even so the gray and yellow are still transposed after the spliced connections. If you don't do that, they will not run. If you trace the wires through you will find that this reversed order happens at the splice junction, not at the motor connectors. As for why yours are not running, if you did not transpose yellow and gray, they will not run. This is because you are electrically cross-connecting the two motor phases. Positive Z lowers the bed because the height of the nozzle will then be greater relative to the bed with increasing Z values, so it is effectively a "positive Z motion" despite the bed moving downward (yes, I know, a bit counter-intuitive, but it is what it is). Also, FT-5 printers home to the right rear rather than the front left as many others do. That is because the other printers move the bed in Y to the rear and the head in X to the left, effectively positioning the nozzle at the front left corner. Plus they actually move the nozzle upwards. But the FT-5 bed only moves vertically and the head truly moves left/right and front/rear. So here X+ goes toward your left and Y+ (when you get it running) will move toward you. Both motions move away from the home position with increasing values. I'm sure there is some grand method to reverse them, but in practice it doesn't matter. They are just rotated 180 degrees from the operator's viewpoint. Ah. OK, I think that's where I'm getting confused. So, do I need to change the pinouts at all the motor ends, swap the gray/yellow on the Y axis motors to be consistent with the other 3 motors, or is there another fix? In retrospect, I don't suppose it really matters on which end the wires switch, does it? If you have the wires set up as shown above they should run. That is how my own printer and every other FT-5 is wired for the Y motion motors. But, be very careful to trace the wires all the way through from the board to the splice, and then on past that. Please connect them exactly as shown on the diagrams I have posted. You don't want to swap the two middle wires at the board end because that would cross-connect the phases. On a single motor wire you are correct, it won't matter. But on a spliced double motor wire it does. If you swapped the middle two at the board end they would become cross-connected for both motors. It becomes rather convoluted because of the reversed motor setup on one side, so the reversal must be done after the spice. So the end you do the swap on does matter. Anyway, I have just now received a nastygram notice from the forum engine that I am dominating this discussion thread, so I will have to leave it at that. Perhaps @heartless or @csorrows or @walter or someone else will add their inputs. Please just connect the wires exactly as shown in the diagrams and see what happens. If they still don't move you may have damaged the step stick that drives the axis and may have to swap it for another one for testing. Be certain of course that you have the motor drive current set correctly. It was a bad stepper chip. WTF. As to the nastygram, I find it hard to imagine that a help forum would have a problem with someone actually helping... but it wouldn't be the strangest thing I've ever seen, either. Yes, if your postings are past a certain percentage of a thread's content (unless you are the original poster apparently, I am not sure what specifically triggers it), in the preview pane at the right a message pops up telling you that you are dominating the thread and might want to give somebody else a chance (more or less). I am very glad that you found the issue. I fried one of my step sticks too, but for a different reason (the infamous USB power down problem). So I wasn't the only one to get these As a non-native speaker I do like the word. Trying to find a similar construction now in Flemish .... Will keep me busy for a while. @Hammerhead: It's one of the advantages of posting on this forum, you will definitely get good advice. Sometimes it is not easy to pinpoint exactly the root cause since there are several possible causes and we or @ron in this case don't have our hands on your printer. No,you aren't the only one who has gotten them. Your English is superb by the way. I couldn't find a translation for it into Flemish, sorry. Somehow I suspect it would be "nastygram" though. Yes, it can be very difficult to troubleshoot something over the forum. Still, I do wish that FT (or Chris or whomever) would add much more specific diagrams and diagram excerpts to the manual such as the ones I created above. They don't take up much space and could be informative for a first time builder I would think. Something like Pestogram would fit more, I think. Onheilspellend is more like ominous. The flemish verb pesten means bullying. So a pest-o-gram would mean ... yes I guess you know already. For Italians however ...I do like pesto very much! Ah yes, pesto. I love it too. I like Pestogram. Works for me.